With digital video consumption rising, both Facebook and Twitter have been working to get in on the action by pushing their own, original content offerings, signing a range of programming partnerships, with a particular focus on live-streaming. And that’s working, kind of. In their latest results, Twitter noted that video now accounts for more than half of the company’s total ad revenue, with particular strength across in-stream pre-roll and mid-roll ads. Facebook, too, is planning to expand its pre-roll ads on Watch content, but the problem for both is that while they are expanding, they’re not keeping up with the rate at which their main competitors – in YouTube and Netflix – are building their on-demand video offerings. Indeed, in terms of digital video providers, Netflix is way out in front, with 125 million subscribers, while YouTube, through its YouTube Red service, has 1.5 million. Clearly, Netflix has the edge, and while Facebook Watch has shown positive early results, as the bigger players continue to develop their own strategies, it’s going to make it more difficult for others to compete. On this, YouTube has this week announced an update to YouTube Red, with the ‘Red’ title being depreciated in favor of two new elements – YouTube Music, which, as it sounds, will focus on just music content, and YouTube Premium, which will cost a little more than YouTube Red, but will provide access to YouTube’s coming slate of original programming. The change reflects the usage patterns YouTube has noted, with a large proportion of Red subscribers primarily focused on music content – YouTube says that “more than 1 billion music fans come to YouTube each month to be part of music culture and discover new music”. 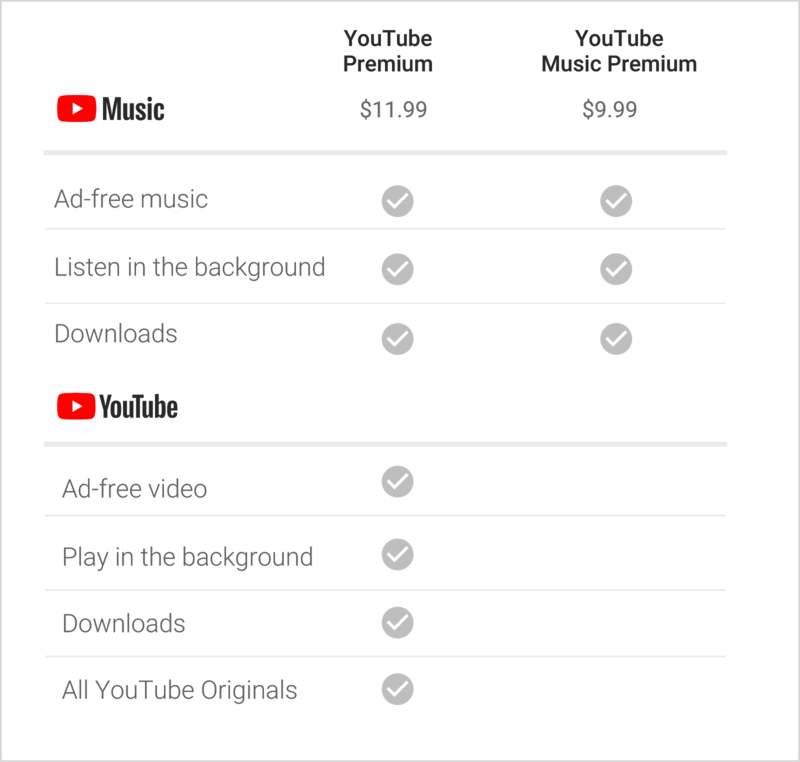 The new YouTube Music app will have both free and subscriber variations, with personalized recommendations, both based on your past behavior and where you are at the time (“At the airport? We’ll recommend something relaxing before the flight. Entering the gym? We’ll suggest some beats to get the heart-rate going”). The updated YouTube Premium will include access to YouTube Music, and is essentially the current YouTube Red, providing exclusive, ad-free access to YouTube’s original programming. Google noted back in February that they would be spending “a few hundred million” on original YouTube programming this year, and the increase in subscriber cost will likely give YouTube more scope to invest in more original shows, making Premium a more attractive offering (note: YouTube is announcing this increase just before the launch of their most hyped original series to date in ‘Cobra Kai’). But the concern for Facebook and Twitter is that these platforms are now moving beyond their reach. The evolution of digital video has provided a new way for people to watch TV – you can now switch across to YouTube or Netflix just as easily as you would any other channel, and the data shows that more people are watching both on their home TV sets more than they are on their PCs and mobile devices (YouTube recently reported that people viewing YouTube content on their home TV set is now their fastest growing usage segment). Definitely, there’s a heap of opportunity in expanded TV-like offerings from social platforms, but given the investment the leaders are pushing into original content, and in the platforms they provide to connect to TV sets, Facebook and Twitter could struggle to match them, which may see them lose ground, as more users develop new consumption habits. Of course, the increased viewership of digital platforms also means people can more easily switch to Facebook and Twitter as well, so long as they can develop more intuitive, responsive TV-connected offerings, which they’ve not given much focus as yet. The bottom line is that YouTube, of all the accessible digital video platforms, is developing a much better offering for advertisers, and for content creators, in terms of building exposure. Facebook Watch needs more work, and Twitter may struggle to truly build their video platform into a much more significant offering. That might not be so bad – as noted, both platforms are already making money from their increased video efforts. But in order to really tap into that lucrative TV ad spend, they need to do more – and they may be being beaten to the punch.